CLEAN UP EASILY & COOK HEALTHIER FOR YOUR FAMILY We used the latest in non-stick technology when we created Cerami-Tech Non Stick Coating. It’s so super nonstick, there’s never any residue left behind on your pan’s surface. Cook without extra butter, oil, and chemicals for healthier meals with reduced calories and fat. Even burnt cheese peels right off without leaving a trace. Clean-up is fast & effortless without soaking or scrubbing. THE SECRET TO EVENLY COOKED FOOD: Our Induction Plates are constructed of heavy duty stainless steel and built right into your pans. Your pan heats up quickly with rapid, even heat distribution for chef-quality cooking. Sear steaks, veggies & more to tender, succulent perfection, bake a mac & cheese casserole or bread pudding with a golden-crisp crust, or use the fry basket accessory to deep fry French fries, wings & more. FROM STOVETOP TO OVEN TO TABLE: Take your pan straight from the stovetop and into the oven with restaurant-quality, 850° heat resistance. You no longer need a different pan or baking dish for oven cooking. Now you can sear salmon or ribs on your stovetop and finish them in the oven – without having to switch pans or use extra bake ware. 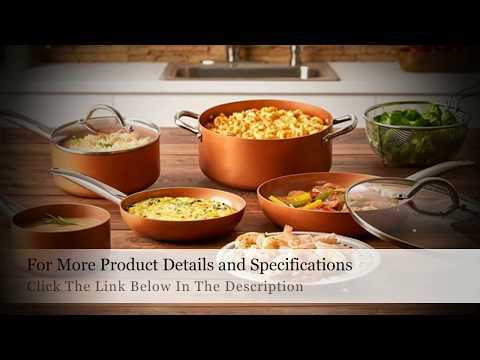 OUR MISSION: Here at the Copper Chef Cookware Collection, our mission is to bring you only the highest quality pots and pans, bakeware sets, skillets & more at the lowest possible prices. We believe every family can enjoy healthy, mouthwatering, perfectly cooked meals without breaking the bank or spending hours in the kitchen.